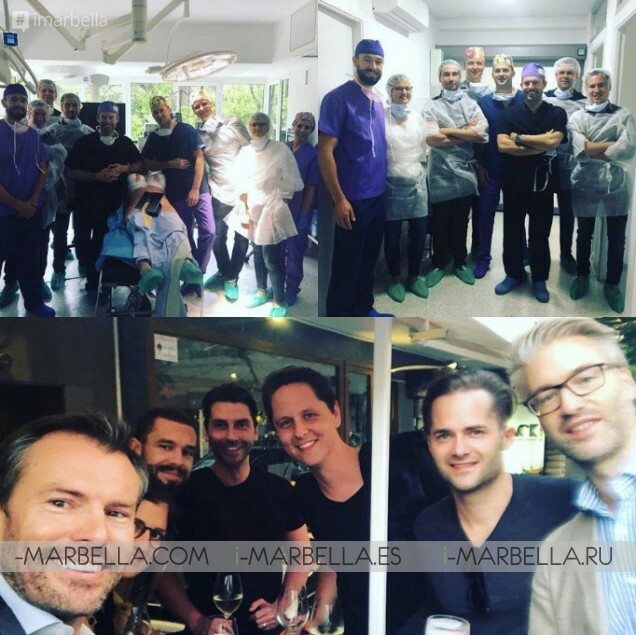 What is Dr.Kai Kaye from Ocean Clinic teaching to the young surgeons in Marbella ? 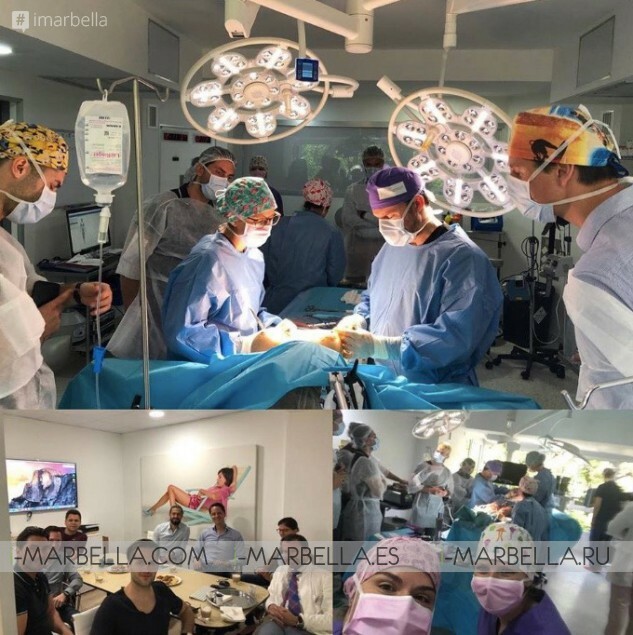 Young surgeons of Marbella joined an annual breast surgery teaching course by Dr. Kai Kaye from Ocean Clinic on May 17 and 18, 2018. During the 2. 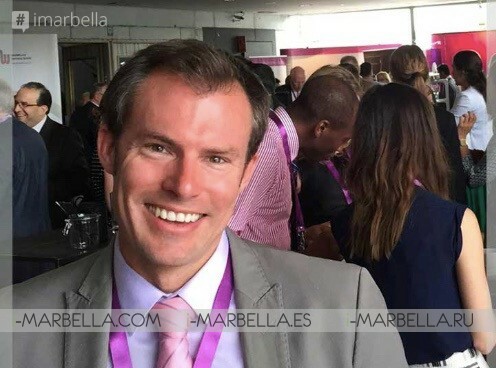 BodyJet Edu workshop in Marbella. Dr. Kai Kaye explained with the first day; breast reconstruction with breast implants and breast lift. 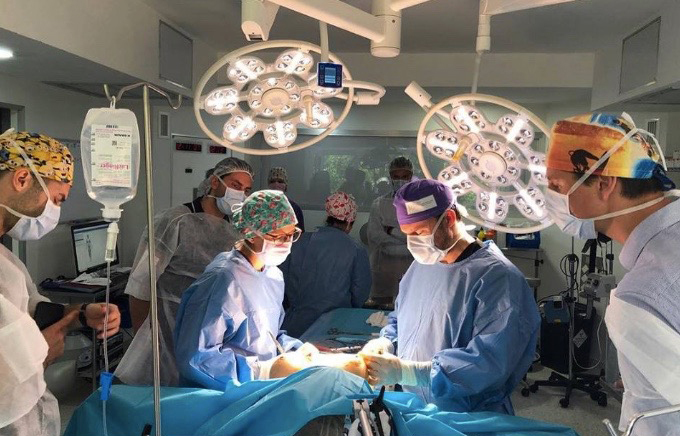 And on the second day; breast implants with composite fat grafting ''dimensional breast shaping'' students witnessed live surgery where they had the opportunity to question and learn the procedures. Dr. Kai Kaye celebrated the 2. 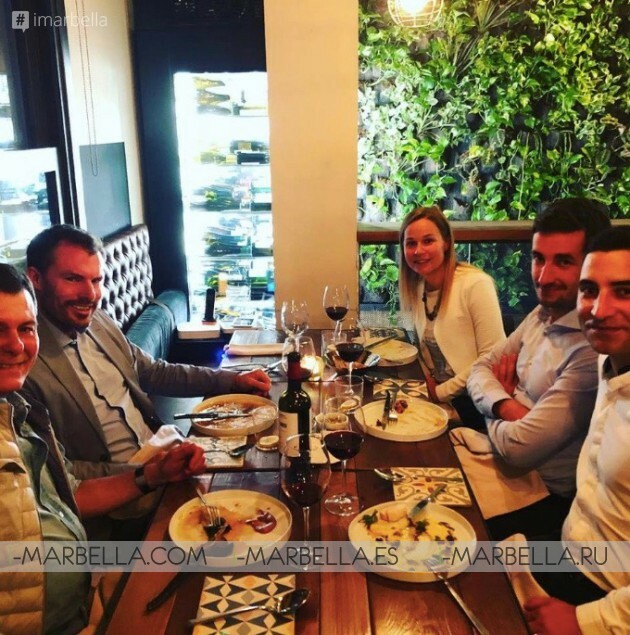 BodyJet Edu workshop in Marbella. During the second day the surgical resident course in Ocean Clinic Marbella. Was about a Secondary Aesthetic Salvage procedure. Students witnessed a live surgery of breast implants with composite fat grafting which was the learning objective of the day - 3-dimensional breast shaping. Prior to the event, Dr. Kai Kaye had a Welcome Dinner for the 2. Bodyjet Edu Center Workshop in Marbella. Posting on Facebook; ‘’Tomorrow a day full of surgeries, teaching and learning awaits us’’. Dr. Kai Kaye said ''Thanks to my great nursing team for the flawless organization and thanks to all attendees for their passion and excellent questions''. Dr. Kai Kaye besides thanking the participants also thanked Upviser and Humanmed for the organization where aqua lift, facelift, and live fat grafting full face were performed by Dr. Kaye and all relevant tips and tricks shared with the assistants. Choosing the right doctor and the right clinic where you are going to carry out a plastic surgery is the first challenge that patients face once they have made the decision to take the step for a surgery. Patients usually consult their acquaintances first, both family and friends. People who have already had surgery can recommend a specialist. The Internet is a good tool, to begin with. That's why we think about you and want to bring you the best tips before making a decision. If you are thinking about a breast augmentation, or perhaps a tummy tuck or a facelift? Dr Kaye is specialized in the field of microsurgery, burn surgery and hand surgery. He has expert knowledge in Breast Augmentation, Breast Reduction, Gynaecomastia, Abdominoplasty, and Facelift. Dr. Kaye pioneered the PAVE-Facelift, a Peeling-Assisted Volume Enhancing Facelift Technique. You can also check here all treatments available for Face surgeries. Ocean Clinic is the only Plastic, Aesthetic and Reconstructive Surgery Clinic in Marbella independent from Hospital facilities. Their premises feature Operating theatres and an overnight patient ward. All patients room are spacious suites with their own bathroom, featuring Flatscreen Satellite TV and free WIFI. They also provide one of the most modern clinics of the Costa del Sol. Spaciously designed over 560 m², the facilities include state-of-the-art operating theatres, a fully equipped medium care recovery unit, various treatment rooms and 5 bedrooms for an overnight stay. All surgery is carried out in our fully licensed and equipped, state of the art operating theatre. A breast implant is a prosthesis used to change the size, shape, and contour of a woman’s breast. In reconstructive plastic surgery, breast implants can be placed to restore a natural looking breast mound for post-mastectomy breast reconstruction patients or to correct congenital defects and deformities of the chest wall. There could be many reasons women would choose to opt for a breast surgery; from the most used ones we have; Enlarge breasts that are naturally small, Restore breast size and shape after pregnancy, weight loss or breastfeeding, Restore symmetry when the breasts are asymmetrical, Restore the breast or breasts after surgery and/or Plastic surgery includes reconstructive surgery and cosmetic surgery. Structured implants are filled with sterile salt water, and contain an inner structure which aims to make the implant feel more natural. Silicone breast implants are filled with silicone gel. The gel feels a bit more like natural breast tissue. If the implant leaks, the gel may remain within the implant shell or may escape into the breast implant pocket. A leaking implant filled with silicone gel will not collapse. Form-stable implants are sometimes referred to as gummy bear breast implants because they maintain their shape even when the implant shell is broken. There are indeed many more but these are one of the most used and important surgeries. Dr. Kaye is a surgeon specialist in advanced Breast Augmentation, Breast Reduction, Gynaecomastia, Abdominoplasty, and Facelift. He developed the PAVE-Facelift, a Peeling-Assisted Volume Enhancing Facelift Technique. Dr. Kaye was named 'Best Plastic Surgeon Marbella' in 2016. The clinic was founded in 2008 by Dr. Kai Kaye, who is a registered Plastic Surgery Consultant in Germany, Spain, and the UK. Dr. Kaye regularly lectures at national and international conventions and teaches at Plastic Surgery Resident courses. Dr. Kaye and his team also carry out charitable work, providing reconstructive surgery and dental work to patients in developing countries.